Ariana Ost's charming necklace lets you pay tribute to your practice, even when you’re not in yoga pants. Pay tribute to your practice even when you're not in yoga pants with Ariana Ost's charming necklace. It features four Sun Salutation poses—back bend, forward fold, downward-facing dog, upward-facing dog—and, of course, a brilliant sun. Inspired by this energizing morning flow, Ariana says, "I love the fluid movement we mimicked in the design to capture the essence of this practice." Handmade from brass in New York City. The sun salutation has great significance to those who practice yoga. 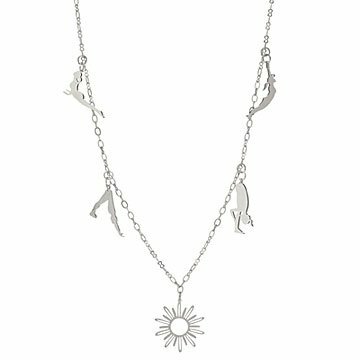 This necklace reminds us of that very important sequence of poses that make up the sequence honoring the life giving sun. The necklace is very well made, and I love wearing pieces of jewelry that are one of a kind.